When we set out to design our basses we do not use standard OEM pickups but we put considerably amount of time and effort testing prototypes, listening and experimenting with different types and different gauges of wire, different apertures of magnets and come up with the most dynamic, natural sounding pickups we ever can imagine. These pickups are the result of the ever ongoing development towards perfection and we feel these pickups are the best pickups we have ever made. Handmade in England exclusively for us by the best in the business and we are proud to put our name on them! Although is built like a standard humbucker in a sense it however works in a completely different way, it is switchable between coil 1 and 2 or both in parallel. This gives much more usable sounds than the old series/single/parallel. If you use two pickups the range of sounds is immense. All settings sounding good, not just one or two. The pickup is not hum-cancelling in single coil settings but fully shielded so a minimum of unwanted hum is induced. Watson basens Nordstrand mikrofoner med Audere elektronik lämnade mycket att önska ljudmässigt. 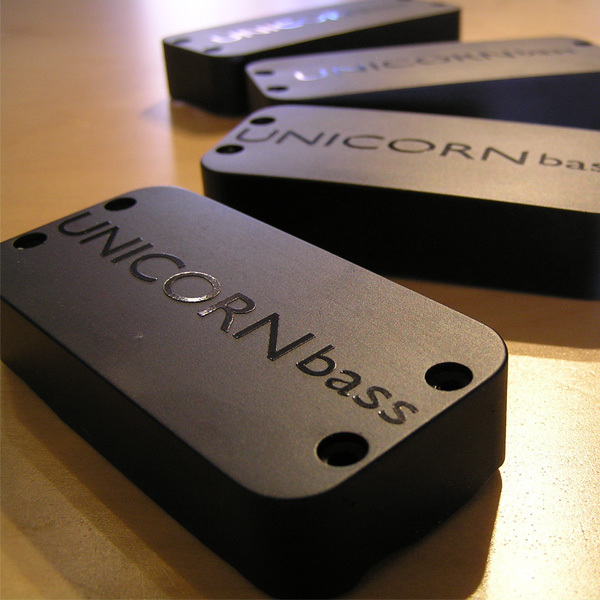 Detta har nu bytts mot UNICORNbass QUAD mikrofoner och elektronik. Skillnaden är ENORM! Bara mikrofonerna i sig ger ett brett spektrum av olika ljud, men tillsammans med klass A EQn med fyra band och passivt diskantfilter blir helheten överraskande bra. Detta är den första preamp jag spelat igenom som inte stryper tonen på något sätt. Det är som att ha en kanallimpa från ett dyrt mixerbord inbyggt i basen. Ett stort tack till Christians engagemang i denna modifiering.